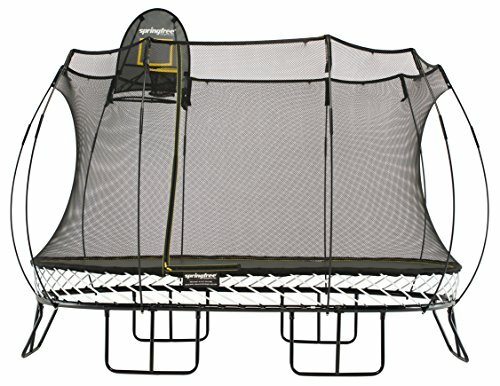 Tight on space in the backyard, but still want a Springfree trampoline? The Springfree Medium Oval trampoline is the perfect fit for you! By nature, rectangular trampolines provide more bounce than a circular or square trampoline. After all, all competitive trampolines are of the rectangular shapes. This is the prefect cross between a rectangular and circular trampoline maximizing bounce and minimizing the backyard footprint. This Springfree Oval trampoline can often be purchased via Amazon with an included flexible hoop and backboard for even more trampoline fun! Price, all Springfree trampolines are priced at a premium. Also, setup can be a challenge. Of all the reviews we have read through, this is the only reoccurring complaint, but all do say it is more than worth it once set up! Q: The enclosure looks a lot different than a traditional trampoline, what’s the difference? A: Springfree trampolines have no springs, thus the enclosure is attached directly to the jumping area. Flexible rods on the outside of the net are specifically designed to gently redirect jumpers back to the center of the mat. Q: How much area will I need to set up the Springfree 077? A: The O77 is 77 square ft, hence the name 077. 8 ft wide by 11 ft long. It is recommended that 16 ft by 19 ft to allow for setup of the trampoline. This will allow jumper to come in safe contact with the net and not outside objects. Q: Can a jumper hit the ground even if there is a net? A: The Flexinet is designed with rigid enclosure rods which do its best to prevent a jumper from falling off the trampoline. Even if the net is misused at high speeds, the net is designed to maintain jumper safety.